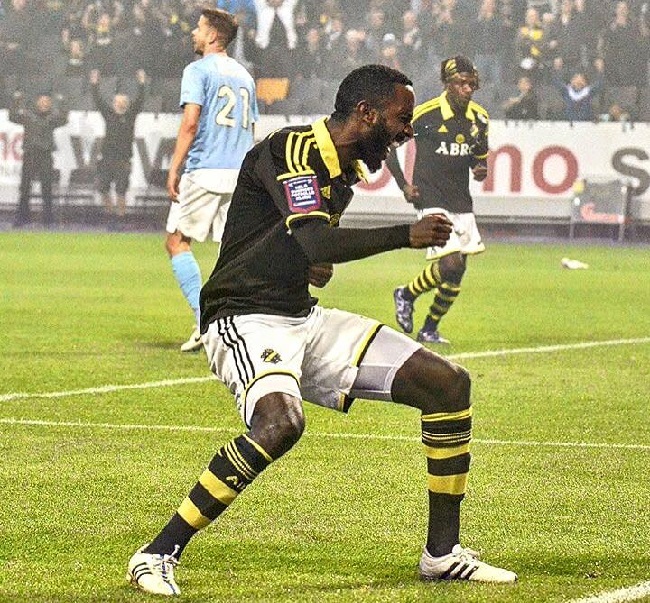 Eritrean striker Henok Goitom scored an early goal on Sunday as his club AIK, third on the table, kept its title dreams alive in a 2-1 win over Swedish champions Malmo. The 12th minute strike was Goitom’s 16th in the Swedish football premiership this season. After leading the scoring chart lately the 31-year-old is now second, three goals behind Norrkoping’s Emir Kujovic. Sam Johnson continues to shine in his debut season. The Liberian international raised the curtains Sunday when Djurgaden destroyed Kalmar 3-0. He has now been on target eight times. League leaders Norrkoping trounced BK Hacken 3-1, also on Sunday, to open up a two-point lead over IFK Gothenburg with three matches remaining. Sierra Leonean marksman Alhaji Kamara came off the bench to set up a penalty and score the third goal. In the female championship, Galle Enganamoit remains unstoppable as she hit her 17th goal in the premiership when Eskilstuna whipped Mallbacken 2-0 on Sunday to stay on top.